Did Twitter Just Pass Digg? 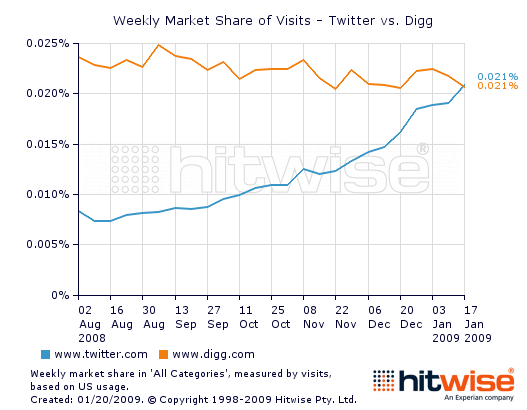 According to Hitwise, last week visits to Twitter surpassed visits to Digg for the first time. Hitwise measures visits in terms of “market share,” which isn’t a very helpful metric (both have 0.021 percent market share, but Twitter is ranked No. 84 and Digg is No. 85). This data is of last week, when visits to Twitter surged following the much-Tweeted emergency landing of a plane on the Hudson. (Note that these numbers do not include usage on mobile devices, desktop apps, or through other Websites via Twitter’s API). Today, traffic to Twitter was even higher with everybody feeling compelled to let everyone else know that, yes, in fact, the U.S. has a new president and that they saw his inauguration speech. (You too?) 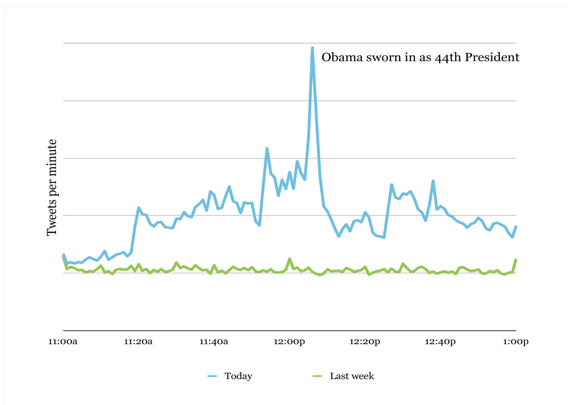 Twitter co-founder Biz Stone blogs that Twitter saw five times as many Tweets per second today compared to last week. (See chart below). So maybe those two lines between Digg and Twitter will keep diverging, or at least keep converging. For what it’s worth, Google Trends for Websites also shows Twitter catching up to Digg (but not yet passing). Other measuring services, such as Quantcast, Compete, and comScore, still show a wide gap. 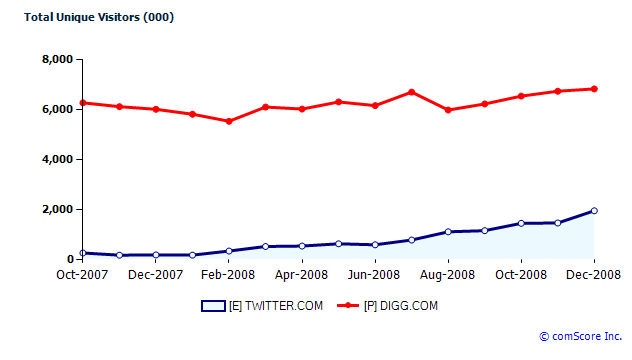 For instance, in the U.S. for December, comScore shows Digg.com at 6.8 million unique visitors versus 1.9 million for Twitter.com. (Update: See second chart below). That’s a pretty big gap to bridge in less than one month. I don’t buy the Hitwise numbers. Do you?